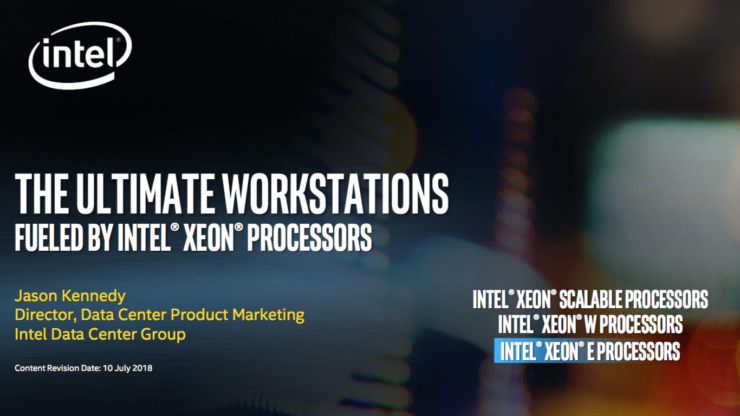 Intel has officially announced their latest Xeon E-2100 series processors which succeed the Xeon E3 lineup. 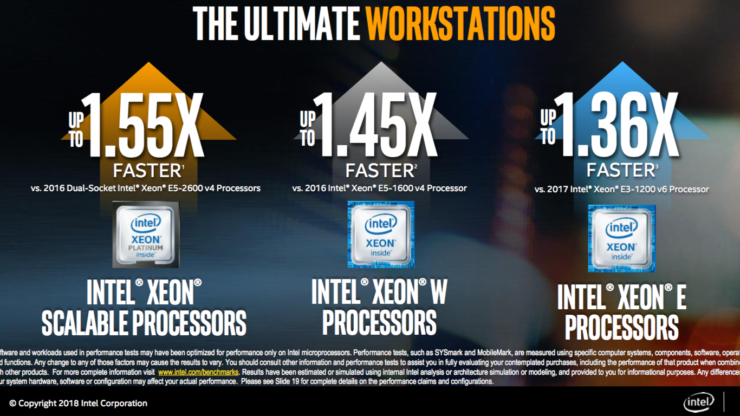 The new processors are aimed at entry-level workstations and deliver a range of features that allow systems to be more productive and deliver a very powerful, single-threaded application performance with a platform optimized for reliability and affordability. 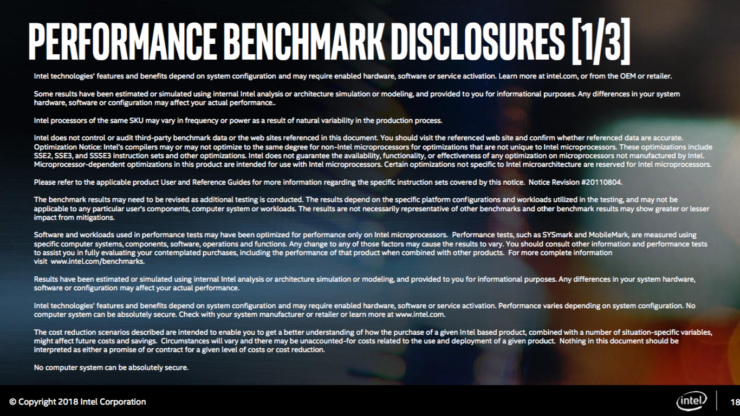 The new lineup features a range of SKUs which are optimized for different workloads and users. 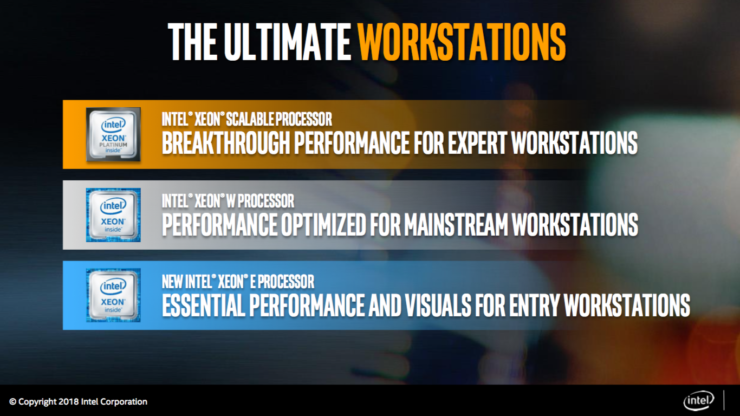 A total of 10 Xeon E-2100 processors exist in the lineup which is based around the C246 chipset, and all pack new features for entry-level workstation environments and providing the essential tier of performance and visual support for workloads that include entertainment (VR), engineering, energy and finance, education and healthcare. 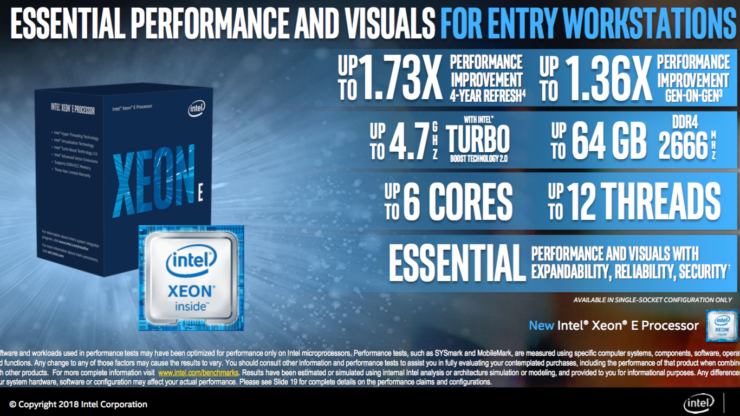 Starting off with the top SKU, we have the Xeon E-2186G which features 6 cores and 12 threads. 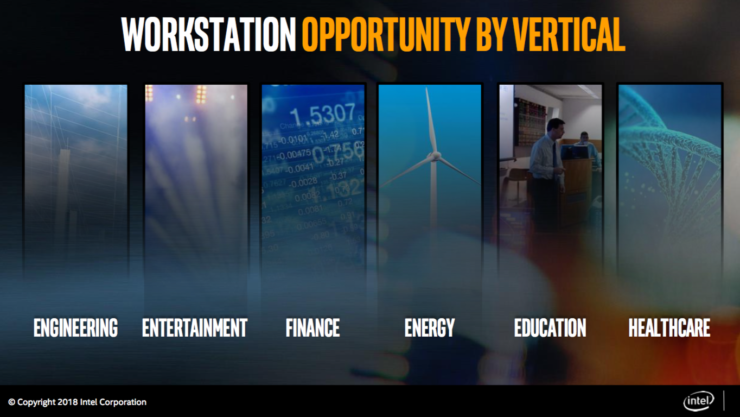 The chip is clocked at a base frequency of 3.8 GHz and boosts all the way up to 4.7 GHz. 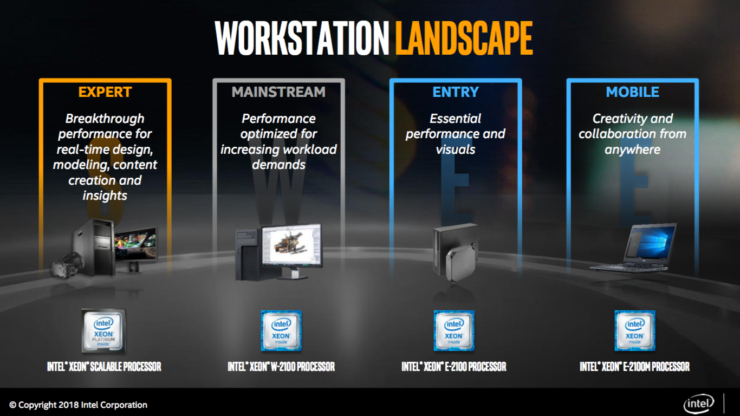 It has a total of 40 PCIe lanes (CPU/PCH combined), 12 MB of L3 cache and support for DDR4-2666 ram. 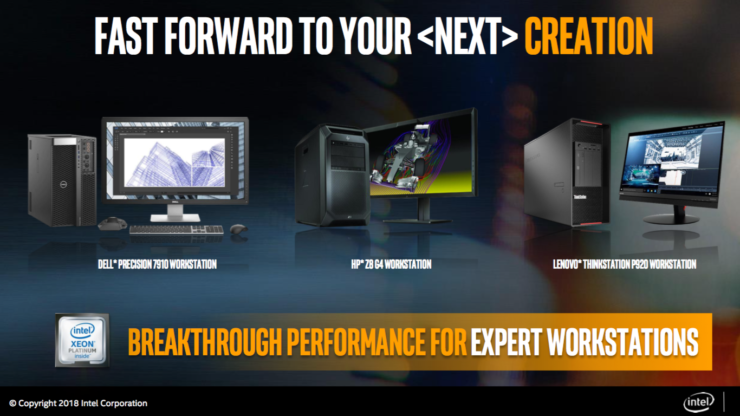 The processor features the Intel UHD Graphics P630 GPU which features 24 execution units and clock speeds between 1150-1200 MHz. 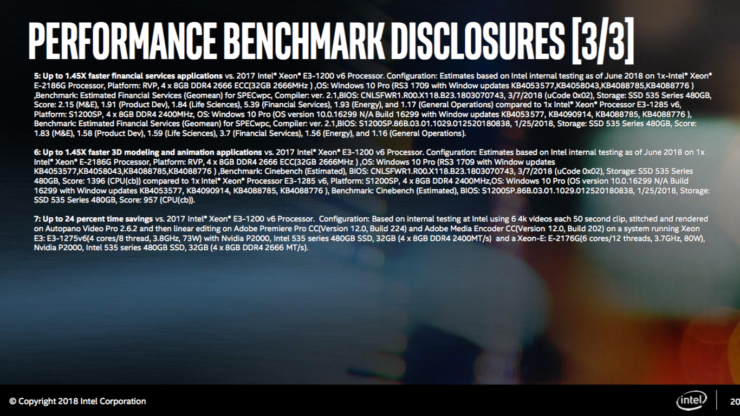 The TDP is rated at 95W and pricing is suggested at $450. The Xeon E-2176G is similarly configured but comes at 100 MHz lower base clocks at 3.7 GHz and 4.7 GHz boost is retained. This chip has an 80W TDP and will cost $362 US. The Xeon E-2146G is also a 6 core, 12 thread part but comes at clock speeds of 3.5 GHz base and 4.5 GHz boost and is priced at $311 US, TDP is rated at 80W. 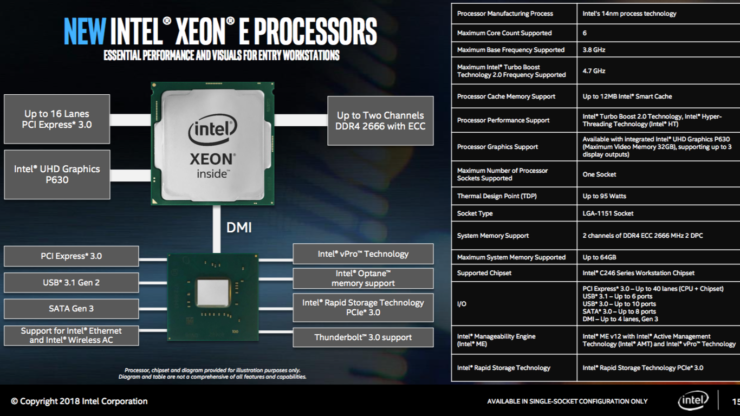 The last 6/12 part is the Xeon E-2136 which comes with a base clock of 3.3 GHz and a boost clock of 4.5 GHz, in an 80W package. 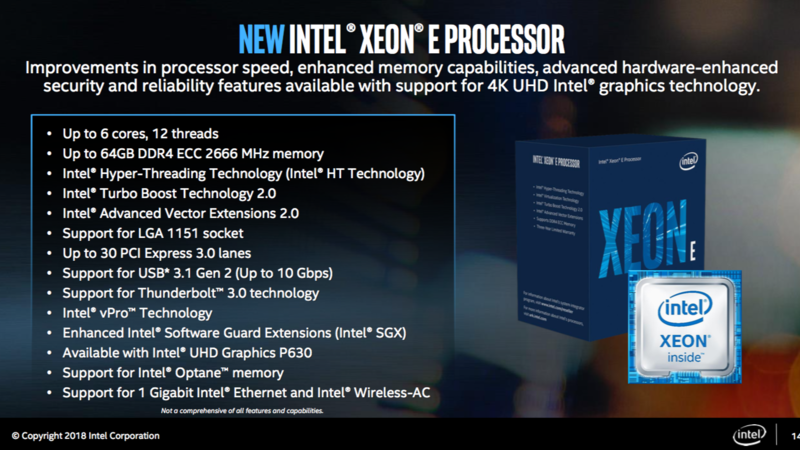 The chip doesn’t feature integrated graphics and is listed for $284 US which is the lowest price for an Intel 6 core, 12 thread part. 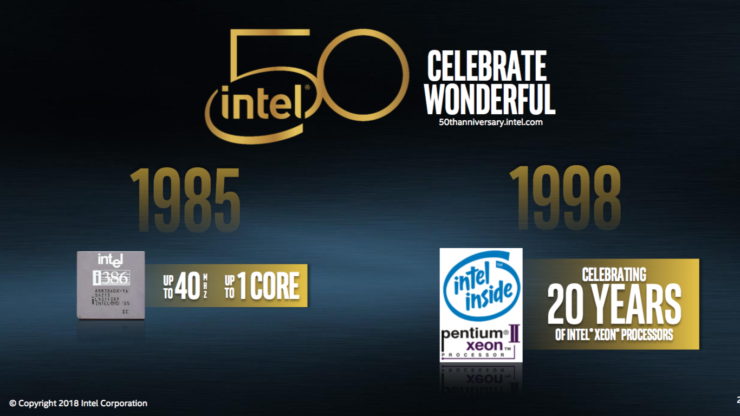 Moving on, we have three 4 core, 8 thread parts which include the 2174G, 2144G and 2134. 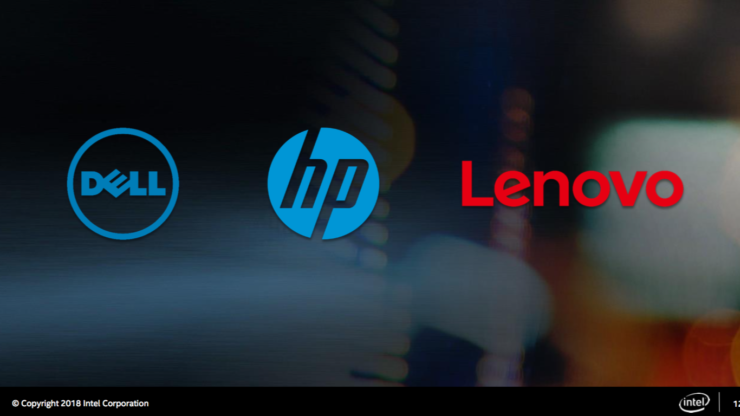 These parts feature a TDP of 71W and have clocked up to 3.8 GHz base and 4.7 GHz boost on the fastest quad-core part. 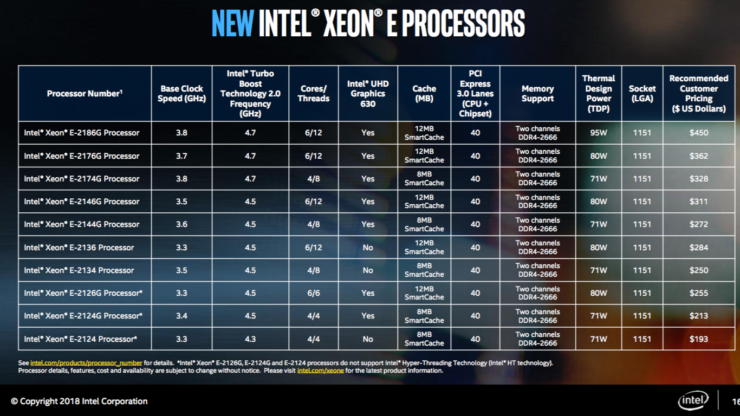 There’s up to 8 MB of L3 cache while the non-G SKU features no graphics chipset. Prices are set at $328 US for the Xeon E-2174G, $272 US for the Xeon E-2144G and $250 for the E-2134. Finally, we have the non-multi-threaded SKUs and you can check out the specifications for those in the table below. 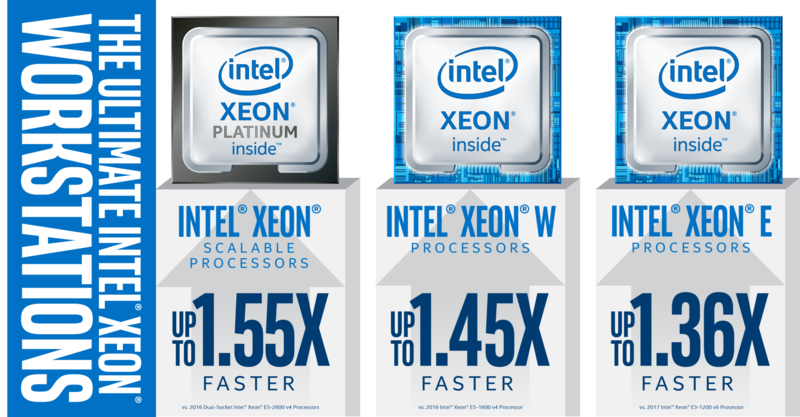 In terms of performance advantages over previous generations, Intel is claiming a 1.73x increase compared to a 4-year-old Xeon based platform and a 1.36x improvement gen-on-gen. 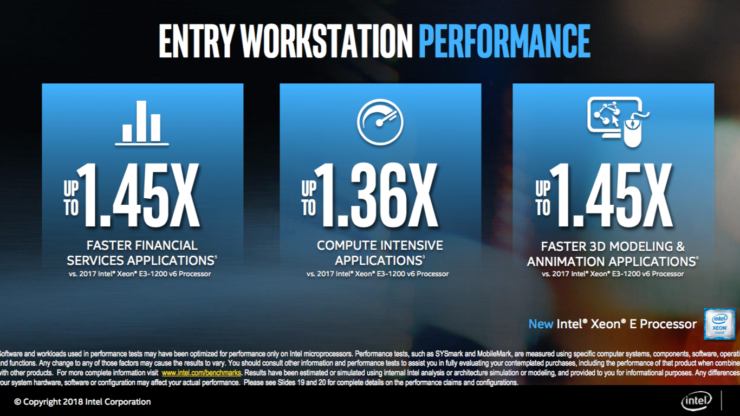 The main reason is largely due to the increased core count which offers more productivity for workstation usage. 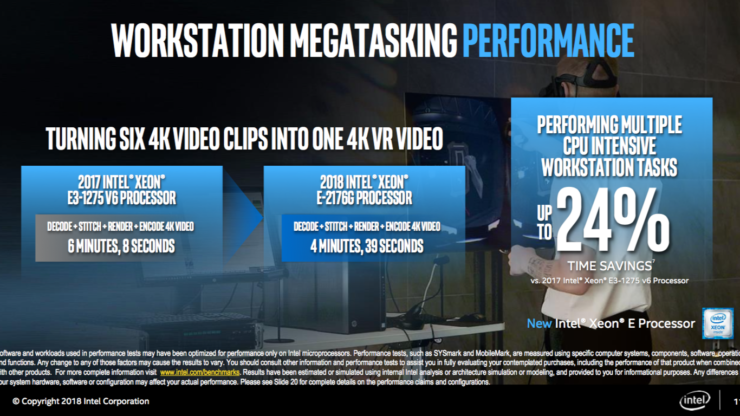 Versus the Xeon E3 V6 (Skylake) flagship, the new Xeon-E flagship offers 24% time reduction when turning six 4K video clips into a single 4K VR video. 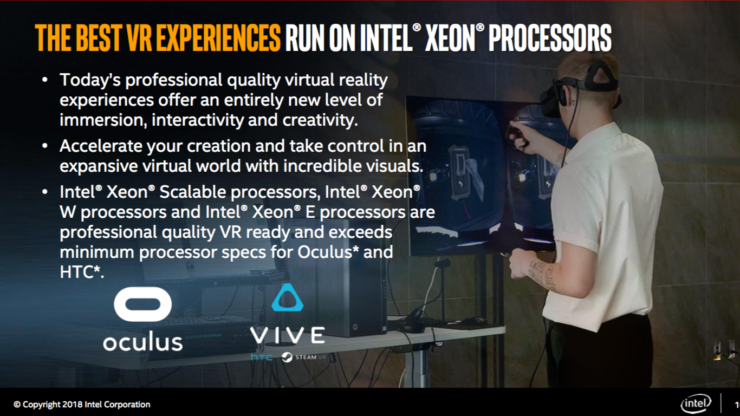 Again highlighting the use of these CPUs in the entertainment industry which is largely focused towards VR and game development. 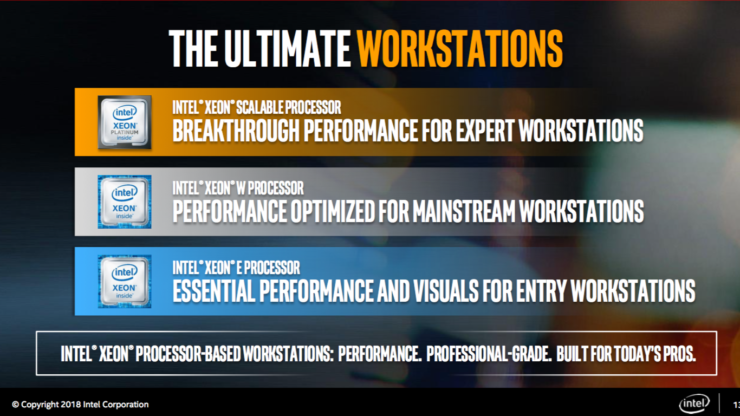 While the launch was much needed for Intel in the mainstream workstation segment, we were still expecting to see an 8 core mainstream part to be featured in the lineup. That doesn’t seem to be the case for now but we are hopeful that it would be added to the lineup when the part is close to a consumer launch.